We've all seen the pictures. Free-floating space travelers look to be having way too much fun frolicking in microgravity. Even with all the daily chores and tight timelines, space crews are finding personal playtime in Earth orbit. Makeshift games can help ease the pressure of work-packed and lengthy missions. Then there's the Apollo 14 moonwalkers back in 1971. Edgar Mitchell threw a "javelin" across the lunar landscape. Alan Shepard also knocked around some golf balls for that ultimate hole-in-one on the crater-pocked surface. Given the growth of passenger space travel, space sports of one type or another are likely. If so, could orbiting stadiums be far behind? An early look at space sports comes courtesy of the Zero-Gravity Corporation (ZERO-G) - a space entertainment and tourism company headquartered in Dania Beach, Florida. Making use of a modified Boeing 727-200 aircraft, ZERO-G provides thrill-seekers that free-fall feeling so enjoyed by astronauts. The firm's "G-Force One" plane makes roller coaster-like maneuvers in the air with dives and pullouts repeated numbers of times for paying customers. 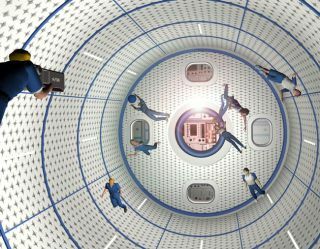 ZERO-G has been looking at a variety of weightless sports, said Peter Diamandis, chairman and chief executive officer of the company. The group has been approached by a range of individuals and companies having an array of ideas for space sports, he said. "From my standpoint, I think watching World Wrestling Entertainment where the competitors are wresting both during the zero-g and 1.8g portions [of flight] could be a lot of fun," Diamandis told SPACE.com. Onboard the company's aircraft, passengers have already played weightless dodge ball and tag. In addition, the company has been approached about zero-g gymnastics and a zero-g fashion show, Diamandis added. "This past fall, ZERO-G was used in the premier of season two of the TV show, The Biggest Looser. For this airing the producers created a competition where teams needed to gather colored plastic balls that were released and floated free. It was a very successful competition with great visuals," Diamandis noted. Busily working on the idea of microgravity sports is Rocky Persaud, President of IPX Entertainment Inc., with offices in Toronto, Canada and Houston, Texas. He plans to create a show called "Space Champions" - a reality TV show focused around a game created specifically to be played in zero gravity. "The sport is called 'Paraball'...originally short for Parabolic Football," Persaud told SPACE.com. "The game really isn't like football anymore as the rules have developed, but the name has stuck," he added. Paraball is seen as a cross of several sports...and has a lot of unique aspects too. "The International Parabolic Sports League (IPSL) I plan to start with seven U.S. based teams, plus one Toronto-based team. Initially all League games would be played from the Las Vegas, Nevada airport, but we'll have 'home' games when the Zero-Gravity Corporation are able to bring their aircraft to that many cities over the time span of the league's season. The reality show Space Champions would train and select the best zero-gravity athletes to draft into the eight original teams, with future expansion ideas also on the drawing board, Persaud said. "The sport I have in mind could make the transition to orbit easily," Persaud stated, eying rental space aboard Bigelow Aerospace inflatable habitats some five or six years from now. That private space facility could host the championship game of the sports league, he said. "Then gradually the entire league could transition to playing in orbit," Persaud said, "though a name change to InterPlanetary Sports League would be warranted," he added with a smile. "Fortunately we do not have to wait until space is accessible at affordable rates to begin with weightless sports," Persaud said. Weightless sports can be offered now, he said, before affordable space travel for the masses has appeared, pointing to the service provided by the Zero-Gravity Corporation, for which IPX is an authorized sales agent. A passionate advocate of space sports, and even an orbiting stadium, is Patrick Collins, Professor of Economics at Azabu University in Japan. "Sports will be more fun the bigger the chamber is in which people play," Collins said, "which will be a stimulus to assemble large structures in orbit, once travel to and from space is much cheaper with reusable passenger vehicles." Secondly, Collins explained, future space sports and facilities will offer great opportunity for commercial sponsorship "since 'zero-g games will surely be very high profile," he advised SPACE.com. In his research on space sports, Collins and colleagues have speculated about water sports where space tourists can dive through large blobs of water. And why not zero-g versions of existing terrestrial sports, such as table-tennis, badminton, tennis, and even basketball? Collins speculates that once orbital accommodations for the space tourist blossoms, more exotic facilities will assuredly follow. Namely, a zero-g sports center that could accommodate everything from ballet, gymnastics, even football. And why not future Olympic games, Collins concluded, held in an orbiting zero-gravity stadium?